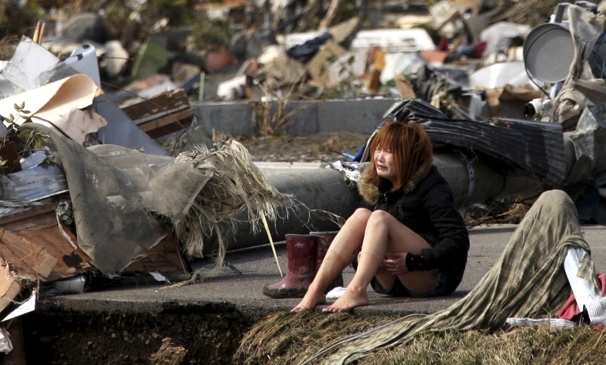 Pray for us and for the people of Japan. Hear our prayers, O Christ our God. Arise, O Christ, and help us. Gracious God, the comfort of all who sorrow, the strength of all who suffer: Let the cry of those in misery and need come to you, that they may find your mercy present with them in all their afflictions; and give us, we pray, the strength to serve them for the sake of him who suffered for us, your Son Jesus Christ our Lord. thank you for this litany …i am sharing it and praying it. the picture is gut-wrenching.i wish i could hold her and hug her. Thank you for sharing and praying the litany. This tragedy is so overwhelming. It seems that sometimes all we can do is hold her pain before God and the world. Thank you. Your litany is beautiful. I “borrowed” it for my blog and gave you credit. Awesome. Thank you for this. I will share this on my blog and with my congregation in CT! Thank you for sharing the litany. We will be praying with you. PS: Fr Michael, we used the litany at Evening Prayer tonight, and we will use it again in the Sunday liturgy, again giving you credit. Thank you. I am glad you found the litany useful. We will also be praying it this Sunday. The pain of the world is heartbreaking. Our community blesses God for you and this beautiful prayer. Thank you Peter. I am grateful for your blessing and prayers. We will pray this Litany this evening at St. Anna’s in New Orleans before we pray the Rosary. It is good to be united in prayer. Peace be with you and St. Anna’s. Thank you for this prayer. Please pray that we can get Nanae, who is 8 months pregnant, out before any harm is done to her unborn child. and in such service find and share the hope of new life. We pray all these things in the name of the one who suffered for us, who still suffers with us, and through whom all suffering and even death shall be overcome, your Son Jesus Christ our Lord, the light of the world. Jennifer, I am glad you will be using the litany. I certainly have no objections to you changing it. I really like what you did with the ending. They are words of beauty and hope.